MASSIVE BREXIT UPDATE. Now includes information on Brexit, what has been said officially and unofficially on the future status of EU nationals, the new online application forms, sickness insurance, low earnings, extended family members, expediting applications, return of passports, what to do if you are refused and much, much more. Need guidance making an application for a residence certificate or card or permanent residence or card? This clear and accessible guide sets out the main qualifying requirements for EEA nationals and their family members and then turns to the practicalities of how to make an application, whether to use the official forms or not and what evidence will be necessary. 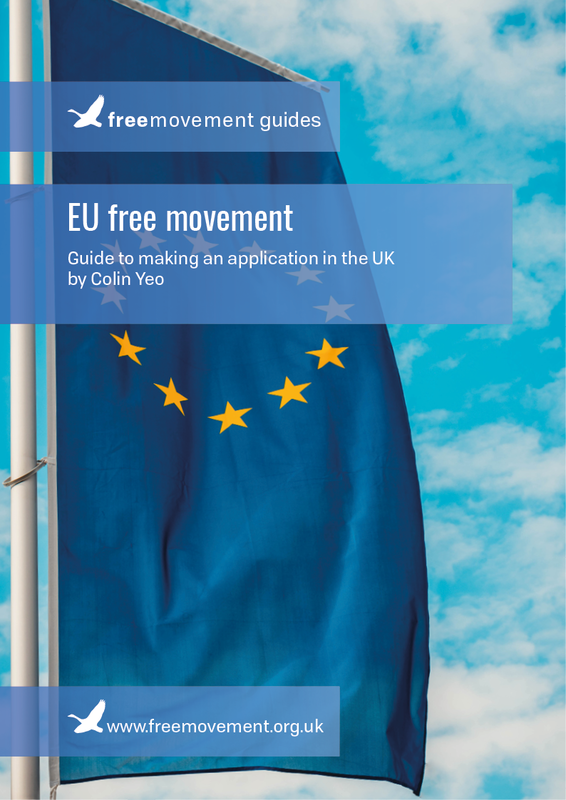 For the most part, EU free movement law is enabling and it genuinely serves to promote free movement of EEA nationals and their family members. In recent years, though, the UK Government has become increasingly hostile to free movement of EEA nationals and several measures have been taken to seek to discourage such movement. Worked examples are used throughout the ebook. The ebook does not cover absolutely every situation and it is not intended to. In particular, it does not cover public interest deportation in EU law nor does it cover Zambrano and derived rights of residence in any detail. Surinder Singh applications by British citizens making use of EU law is dealt with in a separate ebook: Surinder Singh: EU free movement for British citizens. The purpose of this ebook is to cover most types of EU law application for most people who are or are family members of citizens of other EU Member States. Excellent summary of all the issues written by a lawyer for non-lawyers. As an EU citizen, that acquired permanent residence in the past but no longer lives full-time in the UK, it explained all the issues and what I need to do now in order to regularise my immigration status. Despite advising on EU rights of residence for several years I found this guide invaluable. The very clear reminder of the background and principles of freedom of movement has definitely improved my ability to support clients. From a practical point of view, it perhaps does not answer all the questions people have when making applications but I suspect that is because in many cases there are no specific answers! As discussed above, the guide is an excellent overview & does act as a source of support for applications. I wouldn’t expect something of this nature to be able to answer all the fiddly points! Thank you – this has enabled me to help a large number of people. This is a fantastic resource, one that is not only simple to follow and understand for lawyers but for also lay persons; having the uncanny ability to give clear insights to a difficult subject, even for a practicing lawyer of 15 years. This e-book is highly recommended so what are you waiting for?? I purchased the ebook in January, to help with my application for a Permanent Residence Certificate. The guide considerably simplified, what first appeared as a daunting process for me. I followed the advice and tips. I am now pleased to report that I received my certificate recently – no problems. The ebook gave me the confidence that my application was filled adequately and that the documentation I had supplied was satisfactory. I found the examples very helpful. They are examples of individuals, and the guide shows how the law applies to their particular circumstances. The ebook is a great addition to the information available on the website. Thank you, Free Movement, for your support. Really helpful, it offers a wealth of very useful information. It's a must. I have studied the e-book, it provides you with lots of really helpful information and clear explanations, various case studies and examples, it clearly explains to you everything you need to know. In my opinion, this e-book it’s a must for everyone needing such information. It’s really helpful to have all the salient information in a single location, clearly explained. Our particular interest is the enactment of treaty rights to establish eligibility to permanently remain based on self-sufficiency and Comprehensive Sickness Cover. We think we understand the full picture now, thanks to this book so have a strategy for dealing with our particular situation rather than just waiting and fretting. But, we will still follow up by seeking legal advice. It’s too important to get wrong through lack of understanding. I very very helpful. Thanks. Book is factual, concise, and interesting to read. I found it helpful in clarifying and explaining the requirements needed, I’m pleased I paid a low price for this item, to get all this info. While useful, reading this booklet it at times frustrating because the epub formatting is a faulty at times. For example the text in the Example box on Page 38 is cut off on the right edge. Changing the font size on the reader doesn’t change this. Eventually I found out that by double clicking the box the whole text will be displayed as if an image that is being enlarged, but it does rather interrupt the flow of reading. The formatting of the PDF seems better. This book has really a clear and understandable approach to all important EU procedures and practices. Very helpful guidance, quite clear and neatly explain for a neophyte. Big thank you! A good overview, I would recommend overall as helpful, quite liked the part on explaining the Treaties, not something I was after originally, but actually gave me a much better understanding of the legal background and the difference between EU and UK law. The ‘no print’ feature is annoying – I usually print all my reading material and read it during my commute in the evening, so I wasn’t impressed by needing to read it of the screen, as it is quite long. I also hoped for some more details about how to apply and especially about the supporting documentation and how many in reality you have to provide. I found the ebook useful and reassuring on a number of points, especially in terms of what evidence to submit. However, as it is necessarily a general guide, it can’t replace the personalised advice of an expert with regard to any particular complications. What it can do (and what I found very helpful) is to make you aware of the flaws of the system and a lot of potential mistakes to avoid. I would recommend it, but would advise other people thinking of purchasing the book to be realistic about what a general ebook can offer. A good legal framework and an operational support in choosing the best way to apply. Very happy to have purchased! The government guidance and forms are such a tangle but this books makes it clear what is required. The worked examples are very helpful. Highly recommended. I appreciate also your very useful articles. They are giving us hope and help . 18 of 26 people found this review helpful.